The biggest obstacle to the growth of your businesses, is you. If you are feeling stressed and overwhelmed by the volume of tasks that need to be completed. If you’re having to work longer hours to meet deadlines whilst your team members are finishing on time, it could be an early sign that work is not being distributed correctly. As you have worked long and hard to build your business, it could prove uncomfortable to hear that you are creating the bottleneck that is now hindering its growth. Your team can never bring anything to the business if you fail to delegate. There are two key reasons why we fail to delegate. The first is the belief that it is quicker for us to do it ourselves. For a one-off task, that mindset is correct. However, for a repeatable task, think about how much ongoing time that initial handover period will save. The second is that no one can do it as well as us. This is rooted in a lack of trust and is also, quite probably, correct. This is your business so there is a high chance that no one will have the same rapport with your clients, be as good as hiring new staff or understand the financial systems. You need to learn to invest the time in your team and trust them to complete tasks. Keeping hold of, and not delegating key tasks will leave them feeling unmotivated. It will also result in very little work being completed when you’re not in the office, keeping you chained to the desk and possibly making you question why you have staff in the first place. Staff turnover will increase if you only delegate the mundane. Normally the first jobs that we delegate are the mundane tasks that we don’t enjoy doing. The trick is to not only delegate the task but also the responsibility. You want to challenge your team, to motivate them and keep them engaged with the growth of the business. Look at the tasks that you do regularly, such as bookkeeping, rather than the one offs. Also, consider anything that might already fall under a team member’s job description. You want to delegate tasks slowly so that everyone feels comfortable and moral remains high. 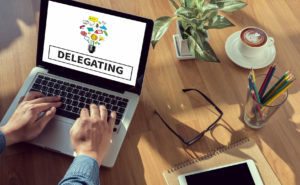 Delegating just the mundane, or shifting all your workload onto under trained and under supported staff will result in a stressed team and possibly a higher staff turnover. Build a confident team by delegating to those who want to do the job. Picking the wrong person to delegate the task to will not only undermine their confidence, but it will reinforce your mindset that only you can do the job. We would recommend talking to the chosen team member and discovering if they want this extra responsibility. You may feel that as your Practice Manager or Admin Assistant already pays invoices and handles credit control, that they would be a natural to take over the bookkeeping. However, problems will arise with method of delegation because if they feel uncomfortable or unmotivated, the job will not be their primary focus. Errors are more likely to be made and any training won’t be fully appreciated. If you discover that you do not have the team members to effectively delegate to, this should be the time to consider an outsourced option, rather than simply continuing to do the task yourself. Are your ideal outcomes specific? Are they measurable, realistic, achievable or even time based? It could simply be that you want someone else to do the bookkeeping purely to save you that block of time each month. However, once you’ve gone through the delegation process, you may decide that now is a great opportunity to get more from that particular task. This could turn ad hoc bookkeeping into weekly bookkeeping. Or perhaps bookkeeping into valuable management reporting. Being clear on the outcomes will also help you to delegate effectively. If you delegate bookkeeping to a team member who is highly competent at bookkeeping, but then question why you are not getting accurate management reports, is not going to have a positive impact on any party. We can help you to review your current systems. Analyse your work flow and pin point the bottlenecks and any inefficiencies. Being Xero certified partners, we can also train your team members as well as offering a full back office solution for your business. If you feel as though you are undertaking too many of the financial duties yourself, or maybe you feel as though you could be getting more from your team please get in touch for a chat.